The Nile Basin Development Challenge (NBDC) was one of six challenges comprising the CGIAR Challenge Program on Water and Food (CPWF). 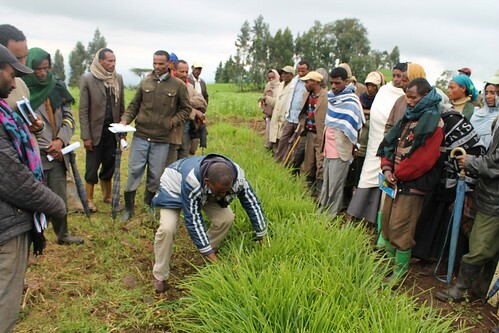 In the second phase of the program (2010-2013), research in the Nile basin (mainly Ethiopia) focused on sustainable land and water management to “enable poor small holder farmers to sustainably and equitably improve their food security, livelihoods and incomes while conserving the natural resource base”. The NBDC was led by the International Livestock Research Institute (ILRI) and the International Water Management Institute (IWMI). The complexity of land and water management in Ethiopia meant that the NBDC adopted a landscape approach “based on the recognition that people living in complex agro-ecosystems have multiple objectives and priorities.” Further a participatory learning-oriented systems approach was used to identify, test and scale up interventions. Empower local communities and develop their leadership capacities to achieve long-term benefits and sustainable outcomes. Integrate and share scientific and local knowledge and encourage innovation through ‘learning by doing’. Strengthen and transform institutional and human capacities among all stakeholders to achieve the potential benefits of sustainable land management. Create, align and implement incentives for all parties to successfully implement sustainable innovative programs at scale. Adapt new models, learning and planning tools and improved learning processes to increase the effectiveness of planning, implementation, and capacity building. Integrate multiple rainwater management interventions at watershed and basin scales to benefit rainwater management programs. Attend to downstream and off-site benefits of rainwater management as well as upstream or on-farm benefits and costs. Improve markets, value chains and multi-stakeholder institutions to enhance the benefits and sustainability of rainwater management investments. As much NBDC work is getting integrated into CGIAR research programs on Water, Land and Ecosystems and on Integrated Systems for the Humid Tropics, this Nile Basin summary is a neat and short review of some essential issues that NBDC has left as a legacy to influence land and water management in Ethiopia and the wider Nile Basin. Tags: CPWF, IWMI, NBDC. Bookmark the permalink. ILRI has made great strides since the 1980s, when the organization was first concritized under Dr. Hank Fitzhughes, who had been by supervisor at Winrock International Institute for Agricultural Development. Then, improvements were driven from the top with really very little involvement with local producers. About that time I had the opportunity to work with Dr. Robert Chambers, who came to the Sudan on consultation. I was field manager of an agroforestry and natural resource management project which, at the time, was wholly technology package driven. Now, ILRI is far more inclusive – a topic I do want to revisit in the near future. Over the past decade I have received a couple of year long grants from ILRI to support and better understand our work in the livestock and natural resource management sectors here in Burundi, a topic also to be revisited. Here are a few quotes from referenced ILRI piece.